LGSoft India Pvt Ltd is looking forward to hire experienced candidates of 2011, 2012, 2013 batches. Looking for candidates for the position of Software Engineer in Research and Development Team at Bangalore location for LG SOFT India. About Aricent: Formerly Hughes Software Systems, Aricent is the only high-value engineering workforce that offers frameworks and enabling software for the most challenging networking and connectivity projects. Aricent exists to engineer and build innovative products and solutions for clients that connect the world—solutions that improve business and society, and make our lives better. Aricent is engineering excellence. Sourced. · Minimum 60% marks in 10th and 12th Std. · The candidates will be working with the development teams in different technologies. · Candidates have to work on outsourced software development, testing, business analytics and software/ applications development services to global clients. · The candidate should be a team player. Note : Interested students are informed to register their names before tomorrow 09.30 am. Date & Time : 7th March 2015 @ 9 a.m. Eligibility : 65% and above in all with no standing arrears. 5. Dress code – As instructed. Qualification: B.E. / B.Tech / M.E. / M.Tech – Computer Science / IT, M.Sc. – Computer Science / IT / Software Engineering, MCA with Minimum 65% and above throughout 10th / SSLC/ Matric / CBSE and 12th / Intermediate / CBSE/PUC. Salary: INR 2,20,000 – 2,40,000/- Annum. Ø Updating, repairing, modifying and developing existing software and generic applications. Ø Must be flexible to work in a team. Ø We are seeking highly organized, energetic and dynamic candidates with great attitude, attention to detail and strong communication skills to join us. Ø Candidates must be team players, have a thirst for knowledge, the energy to work in a fast paced environment and a desire to grow in an entrepreneurial company. Ø JAVA, C, C++ Programming. Ø Database Systems like Postgre SQL , MySQL. Ø Java script, VB script, HTML , CSS, XML & XSL. Salary: INR 2,10,000/- Annum (Approximately) + Incentives, and Salary will be revised after a year based on the candidate performance. Bank Guarantee: 1 Lakh or INR 50,000 however, balance INR 50,000 will be deducted from the salary account of the employee in the name of refundable Fixed deposit Scheme (FDS), only upon successful completion of the Agreement period. In the event the candidate quits during agreement period due to whatsoever reason, including health grounds, the bank guarantee and fixed deposit amount will be forfeit by the Company and further necessary action will be initiated. Ø The Business Development Executive is responsible for growing the company business through communicating over phone. Ø Business Development Executive must be able to assure complete customer satisfaction through all stages of the sales process. Must be able to establish and maintain strong relationships throughout the sales cycle. Ø Telemarketing is the Key Role ! · Identifying sales opportunities and present benefits and key features of products effectively to acquire new business. · Demonstrate ability to capture market and user requirements and communicate them to facilitate marketing and product development. · Meet established personal goals and objectives aligned with company goals and objectives. · Follow company norms regarding sales procedure; product presentation, contact documentation and internal communication with field sales, marketing and product development, daily call volume. · Updating Customer Relationship Management database of the organization with new information. Must possess strong communication and presentation skills and be able to communicate professionally over the phone & in written responses and reports. Organized, flexible and analytical, able to eliminate sales obstacles through creative and adaptive approaches. Ability to cope under rigorous pressure. Persistent with a team attitude. Strong presentation skills and demonstrate ability to effectively communicate with highly-technical as well as non-technical customers. Excellent communicator with all levels of professionals. Highly organized, energetic and dynamic candidate with great attitudes, attention to detail and strong communication skills. Need to be a driven professional and demonstrate a passion for success. Interview with IHIT & IN22 Labs- will happen in Salem, Since both the companies will be coming from Bangalore. will intimate the dates Very soon. Should Come in Complete Formals , Shoes and Clean Shaved. Sutherland Off-Campus Drive to be held at Excel Campus on 4th March 2015 @ 9 am. Travel - One way 3tires A/c train ticket will be provided for outstation candidates. they planned to conduct the interviews in march third week. They have sent the registration link to the shortlisted candidates on their registered email Ids. kindly check that and do what is the needful things according to the mail. TCS Written Results - Reg. Those were appeared for the TCS Online Test are advised to Check the mail for the results and update the same with your co-ordinator immediately. They should be in Excel Campus by morning 7.30 am. Follow the above instructions . . . This is the confirmation mail for your Interview Process with Concentrix. Land Mark: Near Vels University. Pl print this and carry with you as a confirmation. K.S.R. 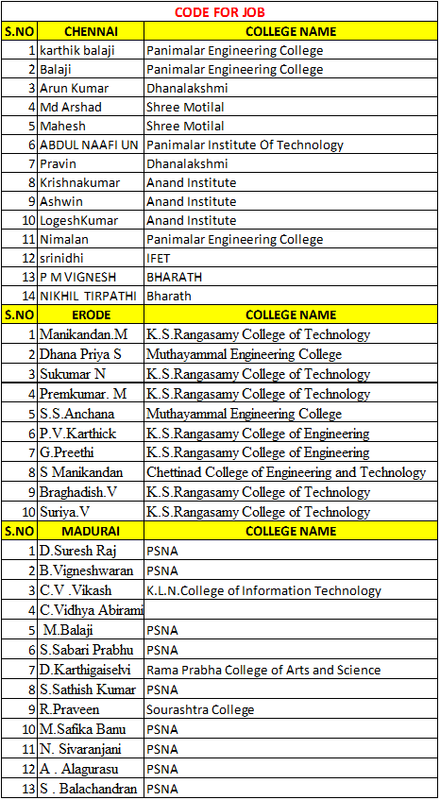 COLLEGE OF ENGINEERING, TIRUCHENGODE - 637215.